We have lived in the area for 32 years. I am a building contractor and build in the Corinth, Iuka and Pickwick area. This project was my first log cabin. I have enjoyed building this cabin because it was different. We have had so many people stop by and look and ask how much would it cost to build them one? I have never had so many people like a property like this one! I have always loved log cabins and had the opportunity to build this cabin this summer. I have enjoyed this project so much. Me, my wife and daughter have put a lot of time and thought into every detail of this project. I custom built every door, the staircase, the beds and the cabin. Enjoy the peaceful setting out on the front porch while you rock in our rockers. Fully furnished bathroom with towels and washcloths provided. Shower/tub combo. Hairdryer, Iron and ironing board also included. Stackable Washer and dryer included. 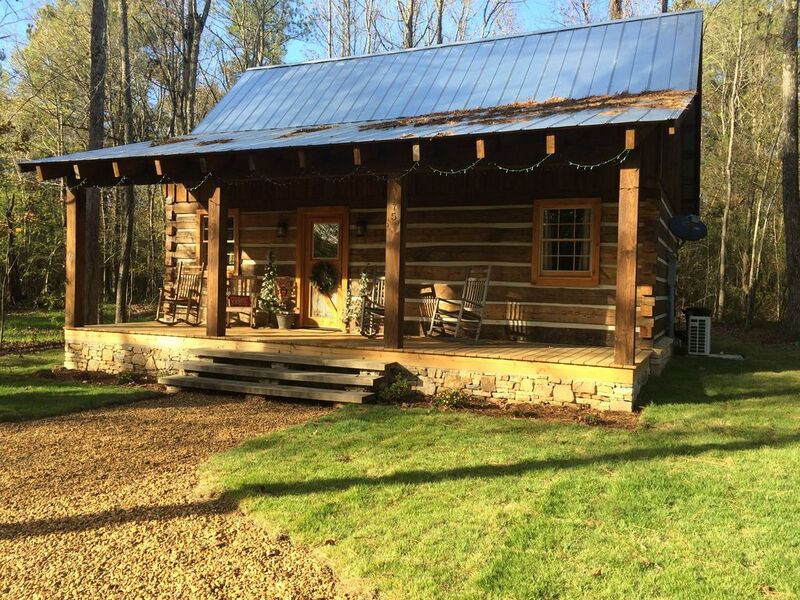 This log cabin was built in August of 2015. Its fully furnished. Private and peaceful setting in the country but close to town. Enjoyed our stay. Was close to Corinth and to Shiloh. Cabin was very nice and would stay again. The cabin is lovely; very comfortable and attractive. The kitchen and bathroom is well stocked. We grilled hamburgers one night ;o). Highly recommend. This is such a great cabin. The owners provided so many extras. Coffee, snacks, hair dryer, reading material, and too many too list. The cabin is close to a lot of cool places to eat and go adventuring. We went to Shiloh Battlefield and just a few miles from that was Catfish Hotel Restaurant. It had amazing food and views of the river. We got a little lost trying to find the cabin, and called the owners and they talked to us until we were on the road to the cabin. Highly recommend this cabin. Lovely as usual. Our fourth stay. Always a pleasure having you at our property. Beautifully decorated little cabin! All the extras that made our stay wonderful! My husband and I decided at the last moment to take a short weekend trip to Shiloh Battle Field. Thankfully, Oakley House was available! It is a spotless,romantic and beautifully decorated cabin with all the extras that made our stay wonderful! Only regret is that we couldn't stay longer! Pickwick lake for fishing and boating within 20 minutes of cabin. Shiloh national park within 25 minutes. Corinth civil war interpretative center within 10 minutes.